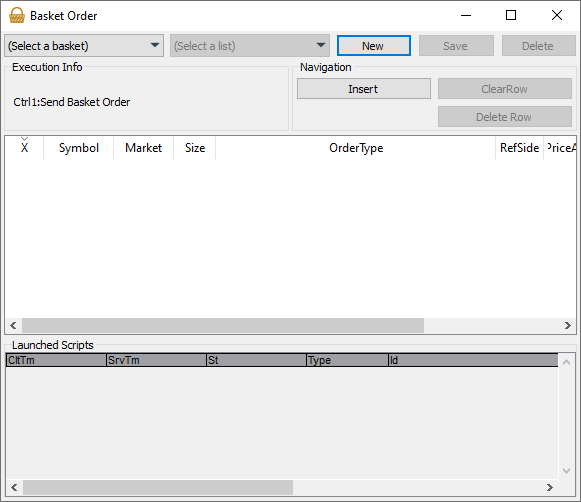 Use the PPro8 Basket Order window to set a single command to send orders on a group of symbols. Note: order types set in Keyboard Setup and clicked in Basket Order must be the same. If you change an order type in Keyboard Setup, make the change in Basket Order to match. 1. On the PPro8 toolbar, click BasketOrder. 2. The Basket Order window appears. 1. Open the Basket Order window. 3. Select a list in the (Select a list) menu (see the Symbols List Editor manual to learn how to create a list). 4. The symbols for that list appear. Click and type in the blank cells for each symbol to set its parameters (Size, OrderType, RefSide, PriceAdj, and Price). 5. Select the check box for each symbol you want to include in the basket order. 6. Click Save, type a name for the list, and then click OK. Your new basket order is saved. 7. To send the basket order, click (Select a basket), click the name of the basket, and then press Ctrl + 1 to send. 8. To cancel the basket order, press Alt + 1. Note: to send or cancel a basket order, the Basket Order window must be on Top.